As networks harness the wisdom of crowds, the ability of experts to add value in their predictions is steadily declining. This is the expert squeeze. In Think Twice: Harnessing the Power of Counterintuition, Michael Mauboussin, the first guest on my podcast, The Knowledge Project, explains the expert squeeze and its implications for how we make decisions. As networks harness the wisdom of crowds and computing power grows, the ability of experts to add value in their predictions is steadily declining. I call this the expert squeeze, and evidence for it is mounting. Despite this trend, we still pine for experts— individuals with special skill or know-how— believing that many forms of knowledge are technical and specialized. We openly defer to people in white lab coats or pinstripe suits, believing they hold the answers, and we harbor misgivings about computergenerated outcomes or the collective opinion of a bunch of tyros. The expert squeeze means that people stuck in old habits of thinking are failing to use new means to gain insight into the problems they face. Knowing when to look beyond experts requires a totally fresh point of view, and one that does not come naturally. To be sure, the future for experts is not all bleak. Experts retain an advantage in some crucial areas. The challenge is to know when and how to use them. So how can we manage this in our role as the decision maker? The first step is to classify the problem. (The figure above — The Value of Experts) helps to guide this process. The second column from the left covers problems that have rules-based solutions with limited possible outcomes. Here, someone can investigate the problem based on past patterns and write down rules to guide decisions. Experts do well with these tasks, but once the principles are clear and well defined, computers are cheaper and more reliable. Think of tasks such as credit scoring or simple forms of medical diagnosis. Experts agree about how to approach these problems because the solutions are transparent and for the most part tried and true. 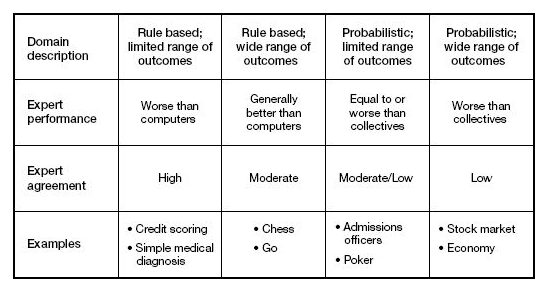 Now let’s go to the opposite extreme, the column on the far right that deals with probabilistic fields with a wide range of outcomes. Here are no simple rules. You can only express possible outcomes in probabilities, and the range of outcomes is wide. Examples include economic and political forecasts. The evidence shows that collectives outperform experts in solving these problems. The middle two columns are the remaining province for experts. Experts do well with rules-based problems with a wide range of outcomes because they are better than computers at eliminating bad choices and making creative connections between bits of information. Once you’ve classified the problem, you can turn to the best method for solving it. … computers and collectives remain underutilized guides for decision making across a host of realms including medicine, business, and sports. That said, experts remain vital in three capacities. First, experts must create the very systems that replace them. … Of course, the experts must stay on top of these systems, improving the market or equation as need be. Next, we need experts for strategy. I mean strategy broadly, including not only day-to-day tactics but also the ability to troubleshoot by recognizing interconnections as well as the creative process of innovation, which involves combining ideas in novel ways. Decisions about how best to challenge a competitor, which rules to enforce, or how to recombine existing building blocks to create novel products or experiences are jobs for experts. Finally, we need people to deal with people. A lot of decision making involves psychology as much as it does statistics. A leader must understand others, make good decisions, and encourage others to buy in to the decision. So what are the practical tips you can do to make the expert squeeze work for you instead of against you? Here Mauboussin offers 3 tips. 1. Match the problem you face with the most appropriate solution. What we know is that experts do a poor job in many settings, suggesting that you should try to supplement expert views with other approaches. (Philip) Tetlock’s work shows that while expert predictions are poor overall, some are better than others. What distinguishes predictive ability is not who the experts are or what they believe, but rather how they think. Borrowing from Archilochus— through Isaiah Berlin— Tetlock sorted experts into hedgehogs and foxes. Hedgehogs know one big thing and try to explain everything through that lens. Foxes tend to know a little about a lot of things and are not married to a single explanation for complex problems. Tetlock finds that foxes are better predictors than hedgehogs. Foxes arrive at their decisions by stitching “together diverse sources of information,” lending credence to the importance of diversity. Naturally, hedgehogs are periodically right— and often spectacularly so— but do not predict as well as foxes over time. For many important decisions, diversity is the key at both the individual and collective levels. 3. Use technology when possible. Leverage technology to side-step the squeeze when possible. Flooded with candidates and aware of the futility of most interviews, Google decided to create algorithms to identify attractive potential employees. First, the company asked seasoned employees to fill out a three-hundred-question survey, capturing details about their tenure, their behavior, and their personality. The company then compared the survey results to measures of employee performance, seeking connections. Among other findings, Google executives recognized that academic accomplishments did not always correlate with on-the-job performance. This novel approach enabled Google to sidestep problems with ineffective interviews and to start addressing the discrepancy. Learning the difference between when experts help or hurt can go a long way toward avoiding stupidity. This starts with identifying the type of problem you’re facing and then considering the various approaches to solve the problem with pros and cons. Still curious? Follow up by reading Generalists vs. Specialists, Think Twice: Harnessing the Power of Counterintuition, and reviewing the work of Philip Tetlock.